As you will remember from my attempts to master the flaming mojito it was decided that flaming mojitos just weren’t worth the effort or the nasty Bacardi 151 taste. Upon that decision I asked my husband, Jim, what are we going to do with the 151 that’s left? He told me that we would flame drinks again, just not mojitos. And so I foolishly asked, what the heck mixed drinks are you going to set on fire? How about non-alcoholic ones? Ha, how about a Shirley Temple? He loved the way flaming Shirley Temple sounded. He liked a flaming Shirley Temple Black as a name even better. I love Shirley Temples! Most of my memories of eating out with my parents as a child involve me being given a sweet Shirley Temple in a cocktail glass with a swizzle stick, just like the adults had. Even now that I’m well past 21 years-old I’ll occasionally order one when I want something that looks like a cocktail but doesn’t have any alcohol. 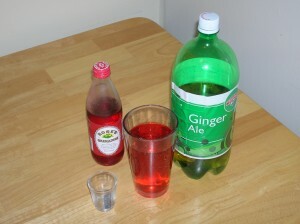 For those of you who don’t know, a Shirley Temple is a pretty simple drink. My childhood memories are of a glass of 7-Up with the juice from a jar of maraschino cherries with a few of the cherries dropped in. 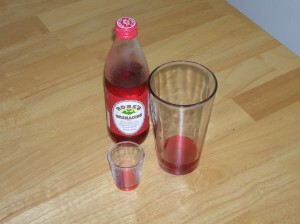 Since we weren’t positive we took a quick peak online and came up with this standard-ish recipe for a Shirley Temple. Jim handed the glass to me and I took a sip, minus the cherry to eat, it tasted like the Shirley Temples of my childhood. This is when I pointed out that if he took a shot of Captain Morgan Tattoo rum and added it gently, it would probably make a black layer on top, and then it could be called a Shirley Temple Black (Which is also a drink, with many different recipes ranging from the addition of vodka, kahlua, orange juice, and more). We added the Tattoo, and sure enough, it made a crimson red drink with a black layer on top. Perfect in appearance for any vampire or goth or goth vampire event. 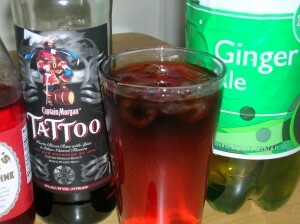 Now for anyone that hasn’t tried Captain Morgan’s Tattoo, it has an odd spiced flavor to it. Not good for shots or sipping, but I find it okay for rum and cokes. I was concerned as to how my beloved Shirley Temple would taste once we stirred the inky spiced blackness of the Tattoo into it. The answer….awesome. In fact, you can’t even tell there is any alcohol in it. This could potentially be the most dangerous mixed drink ever because there seriously isn’t even a hint of alcohol to it. In fact, it tasted so good that neither Jim or I could bring ourselves to light it on fire. 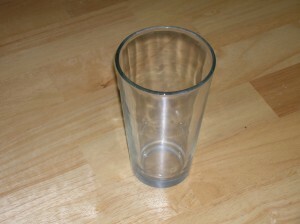 Which is probably for the best, I’m running low on pint glasses. Post Script: After much debate, and suggestions from Greg at What Greg Eats, Jim and I decided to call this drink, Naughty Shirley.